Here are 10 (based on number of followers) Bars & Clubs in Boston that do their social media in style. We've also provided a brief summary of our take on what they do that's different - beyond the regular special offers and greetings on Mother's Day. Want to know more about local businesses rocking social media in your own neighborhood ? The Free EyesAndFeet application has the details. PS: we haven't included the big chains in this list - it just wouldn't be fair - or interesting for that matter. So there you have it: all independent establishments! A tight bond between your Email, Blog & Social Media campaign is always a great strength #constantcontact. Specials & More specials in their tweets. Twitter is the easiest free platform to spread news about your events , and that's a great way to ramp up followers - hopefully, following you into your bar. Yummy tweets and fiery comments mentioning many of their interesting cocktails comprise many of the tweets from this Boston bar. Ask questions and you will get responses on twitter. 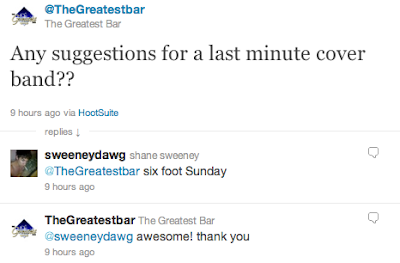 The Greatest bar have a nice balance of replies and tweets that helps keep their conversations ticking. UEFA Semifinal? The Lansdowne's followers probably know where they need to head out to! This rock club has some rocking promos for their events with timely tweets to pull in the numbers. Follow and follow the ones who follow. 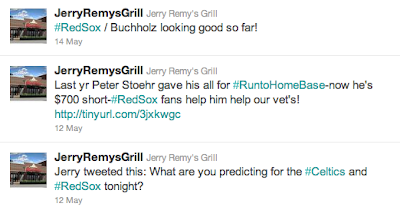 This Boston Grill house follows as many people that follow them on twitter. They follow about 27,399 people! This and some "sporty tweets" makes them Bostons No.1 tweeter.